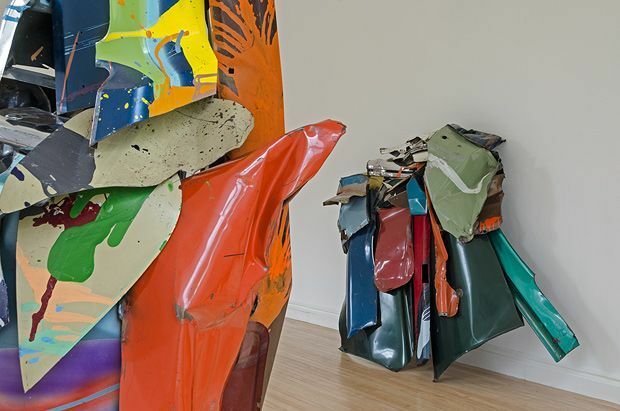 Inverleith House lost its regular funding from Creative Scotland earlier this year, but not before programming a coup for the summer, the first major UK exhibition by the American sculptor John Chamberlain. Chamberlain, who died in 2011, has gone down in the annals of art history as ‘the man who crushed cars’. This wide-ranging exhibition tells us how much of a genius he was. Four large sculptures in bright metallic colours occupy outdoor spaces in the Botanics. They are scaled up versions of late works made in miniature from silver foil, and have a pop-art Jeff Koons garishness. But the real revelation is inside. The ground floor gives us classic Chamberlain sculptures made from car parts. Sometimes they are crushed into new shapes, often they are used as is; at no point does he disguise what they are. Yet they are grouped into new shapes with an acute sensitivity to both form and colour. Chamberlain sculpts like a painter: this is the abstract expressionism of the scrapyard. Upstairs is perhaps more remarkable still: sculptures made from foam, tied with cord, presenting a different face from each new angle; a melted perspex box which becomes a curving translucent sea shell. Again and again, Chamberlain takes ordinary, disposable things – coffee cans, brown paper bags – and, while never denying what they are, transforms them into surprising new things. Inverleith House, 248 2849, until 4 Oct, free. Sculpture by the late American artist who is credited with having made Abstract Expressionism three-dimensional.